Scrapbookers Anonymous has introduced a new mid-month prompt, called the A to Z Challenge. This month, they want you to dig into your stash and find items that start with the letter "B". It can be a manufacturer, or any item that starts with "B", like buttons. Get the idea? I will be focusing on my paper stash, but you can interpret "B" to be anything you can find! I chose to create a 2-page layout featuring Basic Grey's Life of the Party line. You can see my supply list at the end of this post. This is something new I'm trying out. Please let me know if you like it! 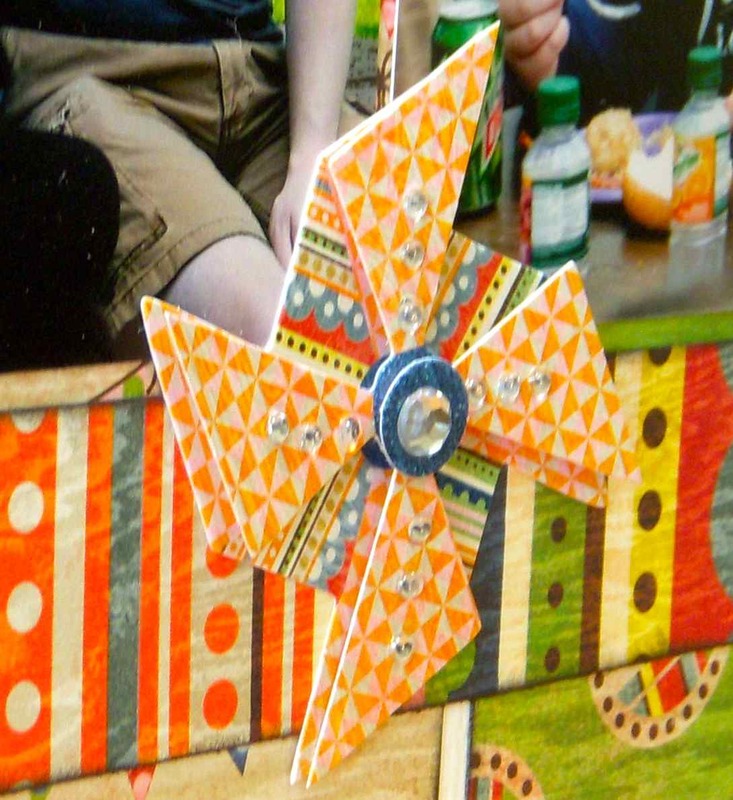 I am trying to purchase fewer embellishments and make my own, but could not resist the pinwheels. (I should figure out how to make these!) Do you try to customize your embellishments, or do you prefer to invest money over time and go with all those lovely pre-made goodies? Hard choice. Maybe a mix is the best of both worlds! Now it's your turn to join in the fun and help you dig further into your stash. All layouts need to be newly created for the challenge, and submitted here by 9pm EST on September 30th. You will then be added to the drawing for this month's prize. I'd love to see what you have lurking in your stash that starts with the letter "B"! You picked the perfect papers for these photos and I love how you lined up the 4x6 photos...looks great! great LO! Love the pinwheels! you always rock the 2pagers. great pattern selection. they go so well with the photos.. and I'm liking the inlinkz. I personally like to mix up the embellies. i really like to fussy cut paper and cut out shapes when I can. What a fun B-based lo! That's such a cheery collection. I usually only buy embellishments if 1) I MUST have them and 2) I couldn't make them myself. My crafting budget is stretched enough as it is! Loving the inlinkz -- I'd use it too if I didn't want everyone to buy their goodies at Scrappy Chic! I Was Featured on Ideas for Scrapbookers!